Energy, and access to energy, are essential to human life, civilisation and development. A number of energy issues - including energy security, energy prices and the polluting emissions for energy use - now have high prominence on global agendas of policy and diplomacy. 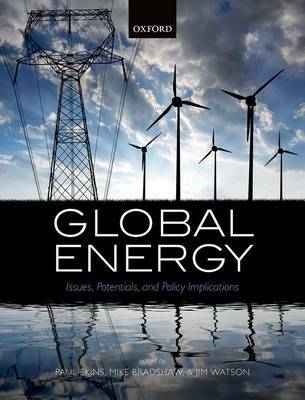 In addressing these and other global energy issues, the purpose of this book is to lay out the broad global energy landscape, exploring how these issues might develop in coming decades, and the implications of such developments for energy policy. There are great uncertainties, which will be identified, in respect of some of these issues, but many of the defining characteristics of the landscape are clear, and the energy policies of all countries will need to be broadly consistent with these if they are to be feasible and achieve their objectives. The book therefore provides information about and analysis of energy and related resources, and the technologies that have been and are being developed to exploit them that is essential to understanding how the global energy system is developing, and how it might develop in the future. But its main focus is the critical economic, social, political and cultural issues that will determine how energy systems will develop and which technologies are deployed, why, by whom, and who will benefit from them. The book has three Parts. Part I sets out the current global context for energy system developments, outlining the essential trends of global energy supply and demand, and atmospheric emissions, from the past and going forward, and their driving forces. Part II explores the options and choices, covering both energy demand and energy supply, facing national and international policymakers as they confront the challenges of the global context outlined in Part I. Part III of the book brings together the discussion in Parts I and II with consideration of possible global energy and environmental futures, and of the energy policy choices which will determine which future actually comes to pass.